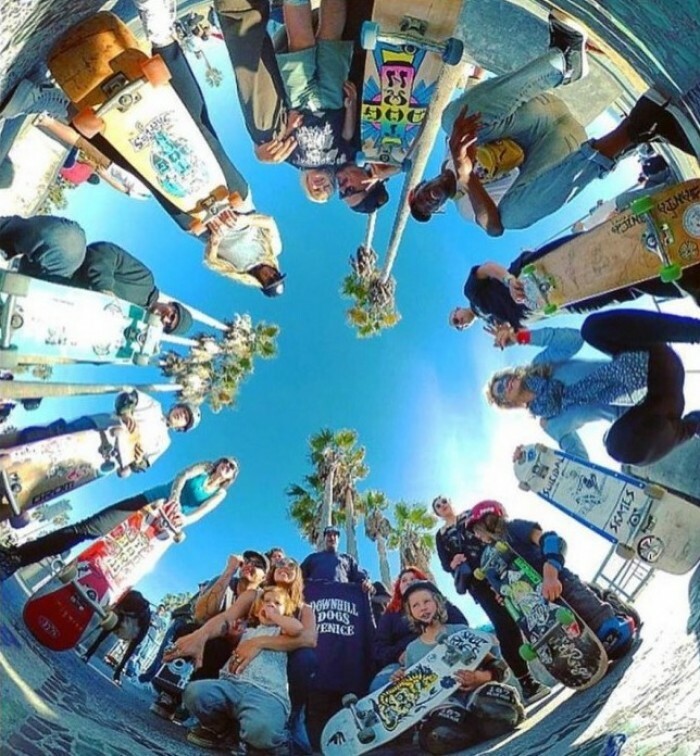 Jeff Ho, Skateboarding Hall of Fame Icon and International Surfboard Builders Hall of Famer, and Dan Levy, Assistant Editor, photographer and filmer for Juice Magazine, review the new Xiaomi Mi Sphere 360 Camera. It’s innovation for everyone. Dan Levy says, “The Mi Sphere 360 is a camera with two lenses on it that shoots 180 degrees on both sides and it is one of the most revolutionary cameras I’ve ever worked with. It shoots full perspective 360, so you can shoot it in different modes like tiny planet, mirror ball, crystal ball, flat, pano and virtual reality mode. You can also shoot time-lapse clips and slow motions clips. Dan explained, “I skated down the Venice Beach boardwalk with it and we shot photos and video at the Venice Mardi Gras parade recently and it opens up a whole dimension to getting creative with a camera. The editing capabilities within the Mi Sphere Camera app open up a whole new world to what you can do with your Mi Sphere 360 clips and photos. The Mi Sphere Camera app offers a full range of options for tethering to your phone and shooting photos and recording video without having to be in the images or clips. You can be up to 50 meters away from the camera and operate the camera from your phone. You can edit your photos and clips in the app, as well as set up a timer for shooting group shots. The app includes multiple filters to have fun with including “fleet”, which has a sepia tone feel, and “youth”, which has a vibrant tone, and “toon”, which gives you an animation style shot and “sketch”, which turns your photos and video into a drawing with sketch effects. You can also take screen shots from your photos and video clips if you see a cool angle or perspective that you want to share on social media. The camera comes with a selfie stick, a camera pouch, a user manual and a USB cable for charging that you can plug into any outlet. The top of the camera has a power/mode button, a mic, as well as a Wi-Fi button and indicator, and a Shutter/OK button. The front of the camera has the lens, battery indicator, a photo status indicator, and a video status indicator, which you can set to show a blue light when it’s turned on. The power/mode button allows you to switch manually from video to photo in the blink of an eye. The bottom of the camera includes the buzzer indicator, the tripod thread, charging contacts and the selfie stick lock. The side of the camera contains the slot for your microSD card and mini-USP port for charging the camera. It’s very important to get the best microSD memory cards to capture all of your excellent Mi Sphere 360 clips and photos. Recommended microSD cards include: Sandisk Extreme US 32G (SDSQXNE-032G-ZN6MA), Sandisk Extreme ProUS 32G (SDSDQXP-032G-Z46A), Kington Us 32G (SDCA3), Kingston US 32G (SDCAC), Lexar 1000x U3 32G, Lexar 633x 32G, Transcend U3 V30 32g, or the Sony u3 16G (SR-16UX2). @taylor_nye at #chinoskatepark #misphere360juice #misphere 🎥 @devillenunes or is it @taylor_nye ? Through the Mi Sphere Camera app, you can also control resolution, ISO, white balance, exposure compensation, recording cycle, remaining video time, exposure time, bracketing, download controls, WiFi settings, memory card formatting, preview mode, auto turn off, buzzer sounds and LED light as well as camera gyro calibration. The Mi Sphere 360 also has a built-in phone gyroscope to bring stability and different exciting viewpoints to your photos and clips. You can also preset the video recording for short 10 second videos or determine the time length in the presets or you can film for as long as your memory card will hold. For example, if you have a 16GB memory card, you would be able to record for 50 minutes! You can record a 2k sports event video at 60 frames per second, or a 4k HD video at 30 frames per second, and adjust ISO, exposure and white balance to record a video in low light. You can take this camera anywhere and it’s great for filming day or night, as well as in the sun and snow, rain or shine. @kikosaucee #chinoskatepark #misphere360juice #misphere 🎥 @devillenunes or is it @kikosaucee? What do you think about this footage? Xiaomi was founded in 2010 by serial entrepreneur, Lei Jun, who believes that high-quality technology doesn’t need to cost a fortune. Xiaomi creates remarkable hardware, software and internet services for and with the help of its Mi fans. You can purchase a Mi Sphere Camera Kit 360 Degree Panoramic Camera here.